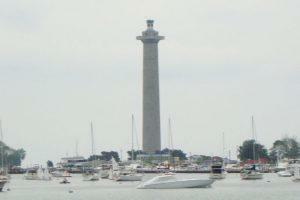 Put-in-Bay offered help to many newcomers. The Indians, the first people to the Lake Erie Islands, used Put-in-Bay for shelter when crossing Lake Erie. When the quick island storms would come about, Put-in-Bay was their protection. The Remains of pre-historic people have shown up all over the Lake Erie Islands. Pre-historic people were common throughout North America – and after the plowing and nurturing of the soil, their remnants were found. Of the main tribes visiting the Lake Erie Islands , the Senecas, Eries, Shawnee, Iriquois, Miamis and Ottawas were among them. The first large ship to sail the Great Lakes was the Griffon, sailed by Robert LaSalle in 1679. They sailed in from Queensland, Ontario to Green Bay, Wisconsin. Lasalle and Friar Hennepin, found many flowers while celebrating the First Mass in the Mid West, and the island was named, Isle des Fleurs. It remained Isle des Fleurs for 200 years. Pierpont Edwards bought a part of the Connecticut Western Reserve tract in 1893 that consisted of Middle Bass, South Bass, and the Sugar Islands. He later became a shareholder in the Connecticut Land Company, and was rewarded with a tract covering Lorain County. The error in this was that the shoreline was uneven and did not provide the correct amount of land that was agreed upon. To correct the error, Edwards was also presented with the Lake Erie Islands, one of which is known as Put-in-Bay. Edward’s kept the Lake Erie Islands in his family for over 50 years, he sent his agent to clear and improve the land of Put-in-Bay in 1811, but never saw the islands. Edward’s agent planted one hundred acres of wheat that was soon destroyed when the Indians, cleared with British support, ran them out in the War of 1812. Oliver Hazard Perry’s victory on September 10, 1813 will be remembered forever. There is a 352 foot high Perry’s Victory and International Peace Memorial honoring the hard-fought victory against the British. The Doric column was constructed for the centennial celebration around 1913 and 1916 and is located in the heart of Put-in-Bay. Lying beneath the floor of the rotunda, are three British and three American officers that were killed during the battle. After purchasing South Bass Island (Put-in-Bay) and Middle Bass Island from Edwards in 1854, Jose De Rivera St. Jurgo, a wealthy Spaniard, brought in sheep, built a sawmill, and had the Island surveyed into 10 acre plots. In 1860, De Rivera established grapes as the crop for making wine. Rhine-landers from Germany came and brought Catawba, Concord, Niagra, and Reisling grapevines to the Lake Erie Islands, contributing to the wine that is present on the Lake Erie Islands today. Land prices rose greatly from $10 to $1500 per acre within only ten years of the wine outbreak of abundance. William Rehburg, a German Count, bought Middle Bass Island from DeRivera. The Golden Eagle winery was the prime wine producer by 1875. After acquiring the winery in 1844, the Lonz family had to rebuild after a disastrous fire with the addition of a marina. Also among the successors of the wine invasion was North Bass Island. French Canadians Simon and Peter Fox, bought 500 acres for grapes in 1853 from island owner Horace Kelly. With 2 prosperous wineries, ships to Detroit, Cleveland, and Toledo, success was at an all time high in 1890. The island is controlled by Meier Wine Company of Cincinnati, Ohio and wine is the main industry. North Bass is known for previously being called Isle St. George, to honor the hermit crab that lived there first. The island is now owned by the State of Ohio, with plans for Ohio’s newest state park. Along the lovely shores of South Bass Island (Put-in-Bay), five luxury hotels were built by 1888. One of the hotels, The Hotel Victory is referred to as a symbol of the peak of the lavish 1890’s. 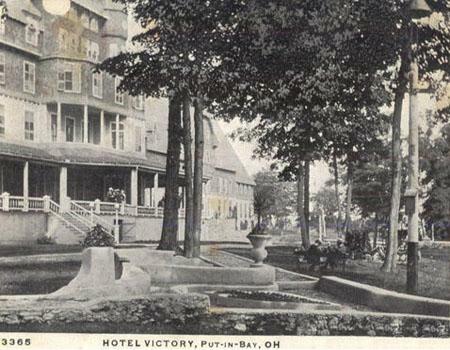 Being the biggest summer resort in the U.S. at the time, the Hotel Victory was operating 27 years prior to being ruined by a fire on August 14, 1919. Today, you can still see the remains of some of the foundation and its swimming pool at the South Bass Island State Park. 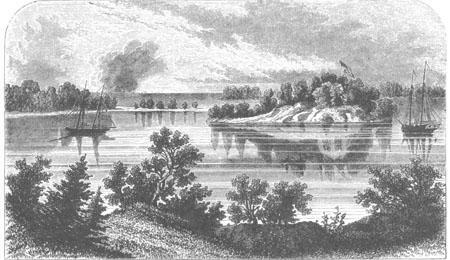 South Bass Island (Put-in-Bay) was once over-populated with Cedar trees, however they are scarce today. 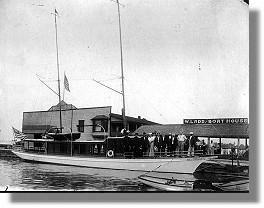 In the early 1900s, excursion boats from Detroit, Toledo, and Port Clinton brought tourists for daily sprees of wine and sunshine. 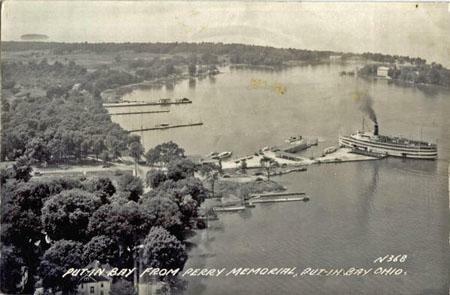 The Put-in-Bay steamer, served Detroit, Put-in-Bay, and Cedar Point and operated from 1911 to 1950. It carried approximately 150,000 passengers a season and at one time twelve steamers stopped a day at Put-in-Bay. In 1918, a prosperous year brought the people from all over together to visit the great Lake Erie Islands and Put-in-Bay. The following year, prohibition came about, and the Put-in-Bay economy was hit hard. Tour boats stopped, and the Lake Erie Islands remained quiet due to The Great Depression. Thankfully, this would all change in 1933, when prohibition was revoked. In 1939, World War II was just beginning. The war caused labor to become short. Shortly after the war, people began to travel again and splurge to enjoy themselves. Private boats began docking at Put-in-Bay, and real estate was in demand. Harsh lake pollution made some people steer clear of the Lake Erie Islands, but university students and adolescents were steady coming. In the late 1970s, the water had shown improvement and proved suitable and the fishing sport became a strong attraction. The Lake Erie Islands have always been a big attraction for fishing fans and will continue to hold the reputation for being one of the best places for high quality fishing game. 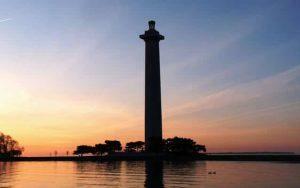 Put-in-Bay attracts many because of its efficient location near major areas. Whether you’re on a daily trip or staying for the summer, visitors by ferry, car, camper, on boat, or even by plane can easily enjoy themselves with all of the sights and attractions Put-in-Bay has to offer. Over the last ten years, Put-in-Bay and it’s growing popularity have seen the addition of new hotels, resorts and numerous family oriented attractions. Tourism has grown to over one million visitors annually. With all Put-in-Bay has to offer, isn’t it time YOU put an Island in your life?